Anthony Martial is all set to force a move away from Manchester United this summer, with Paris Saint-Germain his most likely destination, as per The Express. Martial has apparently grown tired of the treatment he has been receiving from Jose Mourinho this season, and the young forward even believes the Portuguese boss is going well out of his way to push him out the exit door. Jose hasn’t exactly tried to hide his lack of faith in the Frenchman, and his reluctance to consistently include the 21-year-old in United’s starting line-ups – despite Martial performing well enough – has been a worrying factor as well. Furthermore, the former Chelsea boss also shares a sour relationship with the France international’s representatives, who he has criticized on numerous occasions for supposedly diverting the youngster’s mind by talking about prospective loan moves away from the Old Trafford club. However, things went from bad to worse during United’s 3-0 win over Leicester City on Sunday, when Mourinho decided to bring on the likes of Marouane Fellaini and Ashley Young ahead of Martial, thereby revealing how the former Monaco man – who arrived at United as the most expensive teenager in 2015 – has fallen down the pecking order this season. 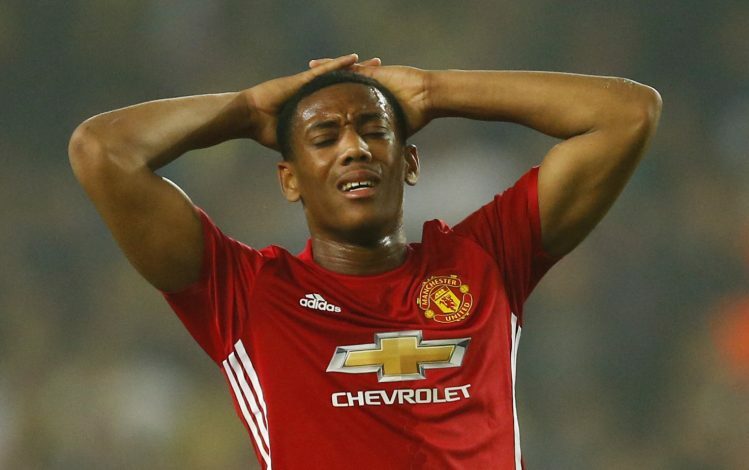 But now, it looks like Anthony Martial has had enough, and come summer, he will try to secure a move away from the Theatre of Dreams with Paris Saint-Germain being reported as his next destination if the reports are to be believed. PSG have been previously linked with a move for Martial as well, and the summer of 2017 could be a perfect opportunity for the pacey attacker to return to his homeland, so as to revive his career and fulfil his world-class potential.